Power Consumption: 440 V, 3Ph, 50 Hz, 6 Kwatts. Maximum width of paper: pleated 610mm, 1000mm, 1220mm, 1500mm.max. Pleat depth: 5mm-100 mm (Variable). Post heating Heaters : upto 2.0 Kwatts. 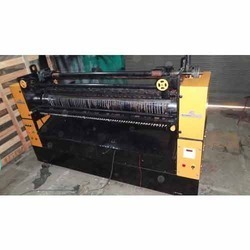 We manufacture and export a wide range of Mini Pleating Machine. These machines are reckoned for their durability and flawless performance features. Our range of mini pleating machines finds application in various paper filtration industries. We offer these machines at market leading prices and also customize in accordance to our clients’ specified requirement. A2Z NANO Pleater series has been designed for production of parallel accordion type pleats with pleat depth of 1.5mm to 5mm on media such as light stainless steel and other wire meshes combination of wiremesh layers etc. This model pleater is servo driven & PLC controlled. Pleat depth can be programmed through touch screen. To cater the variegated needs of our esteemed customers, we are highly engaged in offering a wide array of Multi-Purpose Pleating Machine. - It can be used almost all type of ruffle or pleating. 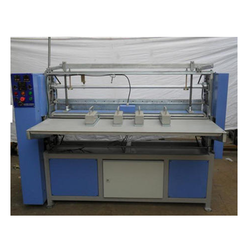 - This machine is available with lock stitching and double needle chain stitch version. We are engaged in offering a range of Pleating Machine. This pleating machine is of a variable speed and gives pleats from 5mm to 50mm and 3000-4000 pleats in an hour on single or double paper. · Machine Weight : 1500 Kgs Approx. Dashmesh international paper & wire mesh pleating machine use for multiple pleater as per your need pleat depth 5mm- 50mm. width of machine 610 mm. & 1000 m. M. & 1250 mm. attached with pre & post heating controlled by dtc. & thermostate. With counter marker unit . Easy to operated the machine & best paper pleated look good in paper pack. Skirt Pleating Machine New Big Pleating 4"
A2Z Rotary Pleating Machines are available for reverse longitudinal dimpling design as shown in the illustration. The retractable insect screen systems have pleated nets for double cassette doors and Balconies that come with wider openings to allow sunlight and fresh air to pass but meshed closely enough to keep insects. We are engaged in the manufacture and export of pleating machine. This machine is used for inside reference pocket and for other reference pocket needs pleat of expanding index folder.